Who is the fastest superhero? Here’s a question that gets asked by comic fans a lot: Who is faster: The Flash or Superman? This week’s Key Comic, Superman #199, was written in 1967 and spotlights the very first Superman vs. The Flash race. Superman #199 is a lot of fun. 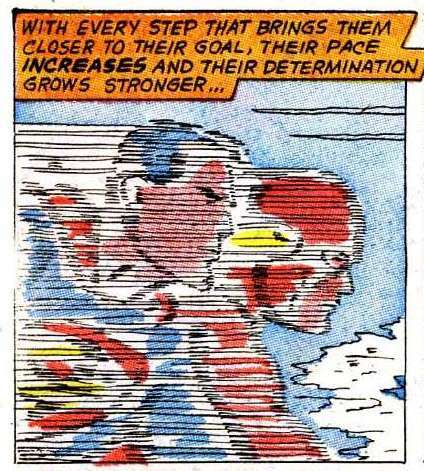 It starts with a request by The United Nations for a charity race between The Flash and Superman, to help raise money for under-developed countries. Since both heroes can travel faster than light, no ordinary race nor course would do. The course is set for three times around the planet, with each circuit following a different challenging path. The race is such a big deal, that two large criminal gambling syndicates place huge bets on the outcome. One syndicate banks on the Flash, and the other banks on Superman. When this much money and stakes are riding on the outcome, you can be sure that each criminal outfit put their own fix on the race! All factors of the story that make it fun to read. When the race starts, a large number of DC Super heroes show up to lend their support and either root for Flash or Superman. The comic evenly assigns heroes between the Superman and Flash camps, a who’s who list of DC superhero appearances the likes of Batman, Robin, Wonder Woman, Supergirl, Green Arrow, Atom, Aquaman, Martian Manhunter, Hawkman and Green Lantern. On your mark, get set…GO! The race takes place in several countries, we get to see lots of exotic international locations from around the world…the Sahara desert, Egyptian pyramids, Red Sea, Iraq, the Himalayas, India, Philippines, Hawaii, Africa, Australia and more! Wonder how those 2 criminal organizations try to fix the race? 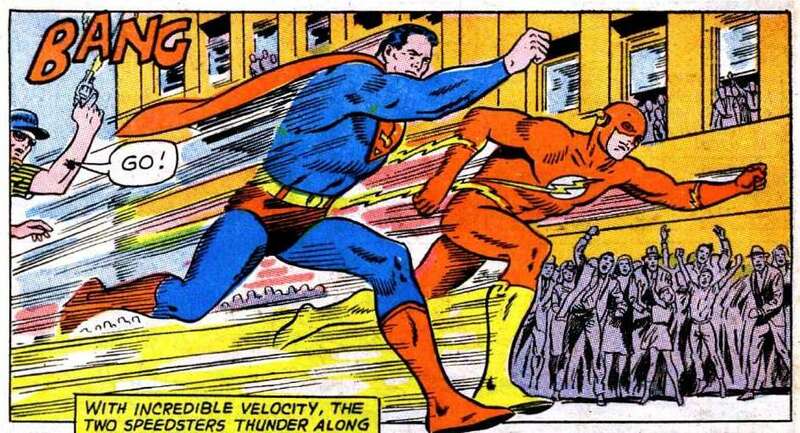 Both outfits try to stop the Flash and Superman by placing their own phony replacement heroes to finish the race in their favor! Lets not forget that you can’t have a classic Superman story unfold without Kryptonite so in this issue we get not one but two Kryptonite appearances…Nice! The issue is packed with story content, twists and turns. I won’t spoil the ending by giving away the winner, you’ll have to read it to find out! If you can’t find the comic or think you can’t afford it think again. All of the classic Superman vs. Flash races have been reprinted in one paperback volume, you can find a copy here. A funny side note, if you’ll notice on this comic’s cover, Batman (know to be one of Superman’s closest friends), is shown rooting for the Flash, however inside he’s roots for Superman! DC, what gives? Maybe this is what fueled the Superman v Batman saga (movie). I can’t end this without putting my 2 cents in on who the fastest runner is/should be. In my humble opinion the Flash is the fastest man in the DC Universe! Why? Because Superman is DC’s greatest hero, the strongest and most invulnerable, but not the fastest runner. Come on does he have to be the greatest everything, including the fastest runner too? The Flash’s signature trademark is his speed, I’ll accept that Superman can fly circles around him but not lap him running. Don’t get me wrong, I have a soft spot for Superman. As a kid, Superman was my favorite hero, I would have rooted for him in this race along side Batman. The Christopher Reeve’s Superman movies were a very strong influence on me, and my future comic collecting. With that being said I stand by my ruling that the Flash is the fastest runner and Superman can have the rest. This fastest Superhero question continues to be contested and put to the test by many, everyone has an opinion. Who do you think is the Fastest Man Superhero? 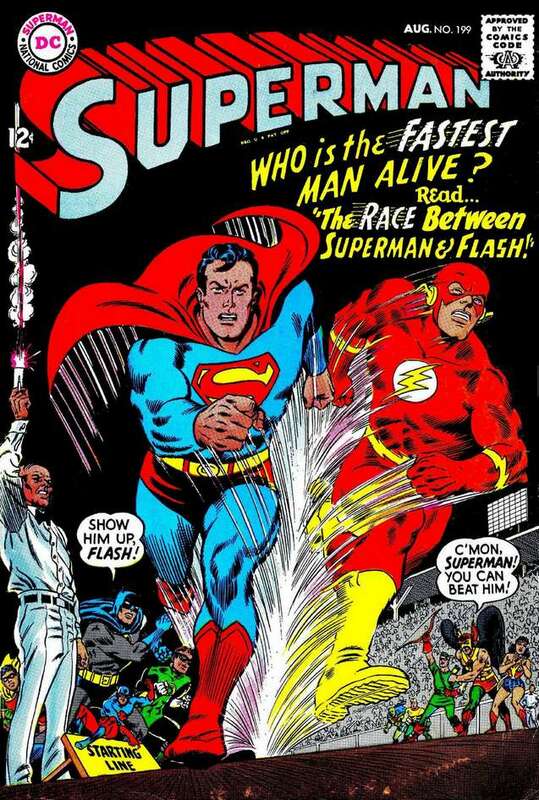 Please post a comment on who you think is the fastest, Superman or Flash… let the debate continue! Overstreet Comic Book Price Guide #45 (2015) has the NearMint of this comic at $800.00. The value has increased $100.00 (14%) since last year and an overall increase of $590.00 (381%) since 1999. This key comic started the eternal debate and will continue to be sought after by comic fans for years to come. The current Flash TV series has added to the popularity of the character and therefore can drive up the price of this comic. I have collected all of the Flash vs. Superman comics over the years, and will continue to do so with the hopes of seeing a rematch! Click on chart for larger view. A longtime comic fan of almost 30 years. Worked on comics, had a store, and now write about comics. I vote The Flash! When you apply physics to it…you could also argue that at the speeds Flash is able to reach a punch from him would be stronger than Superman’s. Thanks, I really appreciate the feedback! I post new articles a couple of times a week. Excellent goods from you, man. I have take into accout your stuff previous to and you are simply too magnificent. to stay it smart. I can’t wait to learn much more from you. That is actually a terrific website. also glad to share my knowledge here with colleagues. I simply want to say I am all new to weblog and seriously enjoyed you’re web blog. Most likely I’m going to bookmark your blog post . You certainly come with superb article content. Thank you for sharing your web site. Wonderful web page you have got here. We are comic collectors like you, and are passionate about comics. Wednesday is our favorite day of the week, with a trip to the local comic stores, to grab the newest comic treasures! © 2015 PlanetComic.com. All Rights Reserved.